Start saving money by using our Roulette Strategy Card and start maximizing your odds, playing with perfect strategy, by making smart bets on every spin of the ball. Our strategy card shows you every bet that can be made on the roulette table by using a pictorial of a roulette layout and where all the different bets are placed, what the bets are called and the winning payoff of all the bets. 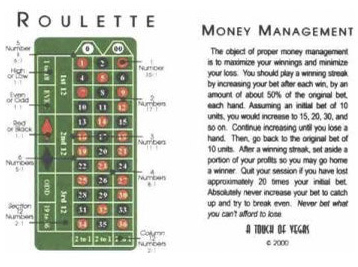 This side of the roulette strategy card contains a good general principle money management reference dialog. It tells you how to maximize your winnings and minimize your loses for almost any of the gambling game. Millions of Americans enjoy recreational gaming and poker, but dont always know how to play well and quickly tire of losing. These strategy cards enable people to play with more skill and confidence. They help provide a more pleasurable experience while offering greater value for their recreational dollars.